Since you ran out of Girl Scout Cookies months ago, it's sadly no longer the season for Samoa "blizzards". 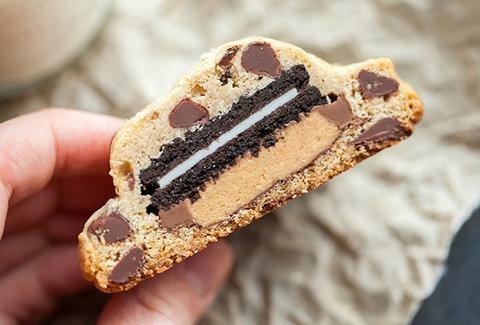 But thankfully, their creator has another treat to keep you occupied until another Brownie knocks on your door: chocolate chip cookies with Oreos and Reese's baked right in. Now, you could just grab some Toll House, Oreos, and PB cups and go to town, but Spache the Spatula takes a little more pride in her work, so she made the cookies from scratch. After you've finished blending that cookie dough, scoop out a bunch of 1.5oz balls and flatten them into small circles. Place one circle in your hand, place a Reese's and an Oreo on top of that, and then close it all up with another dough circle. Mold it back into a ball and repeat, until you have an entire batch of jacked-up chocolate chip cookies. You could even opt for Reese's Oreos for an extra-peanut buttery kick, but only if you're prepared to reap the addictive cookies you sow. Kristin Hunt is a Food/Drink staff writer for Thrillist, and needs a moment. Follow her to cookie hysteria at @kristin_hunt.